Look, we like drinking, okay? So it would be great if we could get a definitive answer from the various scientific studies and health professionals as to what, if any, is the acceptable level of alcohol consumption. Why, just last month we were thrilled to learn that a study of a group of nonagenarians showed that their considerable longevity could be attributed to daily glasses of wine (along with exercise, and hobbies). 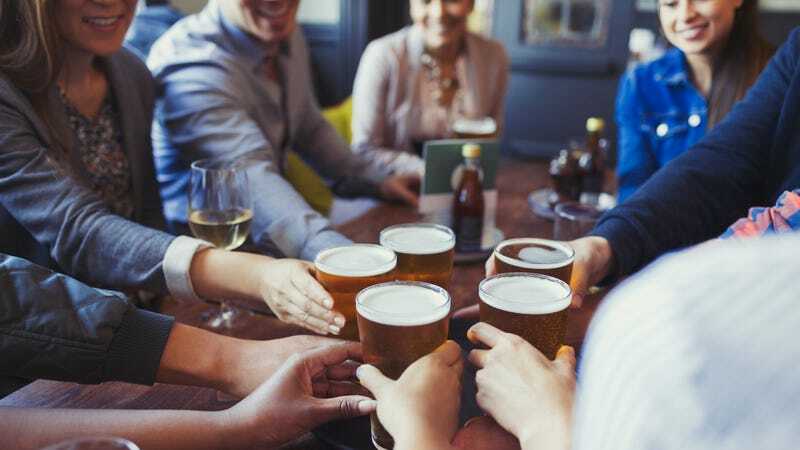 The thorough Lancet report was titled, “Risk thresholds for alcohol consumption: combined analysis of individual-participant data for 599,912 current drinkers in 83 prospective studies.” There’s a lot to wade through, but the discussion section of the report summarizes, “Exploratory analyses suggested that drinkers of beer or spirits, as well as binge drinkers, had the highest risk for all-cause mortality.” The BBC adds, “The 2016 U.K. guidelines recommend no more than 14 units a week, which is six pints of beer or seven glasses of wine. Authors of the Lancet study said their findings backed up the new guidelines and also said they did not find an increased risk of death for light drinkers.” So we guess the gist is that you can still drink, but not too much. Moderation in all things, apparently, is key. Until the next study, that is.